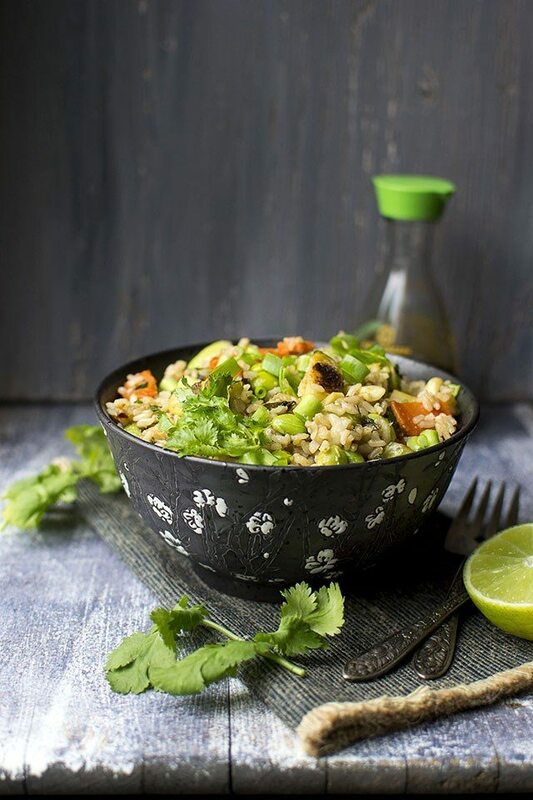 Brussels Sprouts Fried Rice is a colorful and absolutely delicious dish. It is very flavorful with the addition of sauteed herbs. Heat 1 tbsp coconut oil in a large pan over medium-high heat. Add the Brussels Sprouts and carrots and cook till the veggies are crisp tender and getting lightly browned around the edges. Add the cashews (or pine nuts) and cook for 2 more minutes or until the nuts are toasted. Transfer the veggies and nuts to a large plate and set aside. Heat the remaining 1tbsp coconut oil in the same pan. Add ginger, garlic and cook for 30 seconds or until fragrant. Next stir in the green onions and the chopped herbs. Cook for about 1~2 minutes. Add the thawed edamame and cook till heated through, about 2~3 minutes. Next add the rice, red pepper flakes and cook for 3~4 minutes. Finally add the Brussels sprouts mixture, soy sauce, lime juice, agave nectar and salt. Toss until all the ingredients are well combined and cook for 2~3 minutes. Taste and adjust the seasoning. Serve immediately.